Who Will Open the Door and Let the Light Come In? 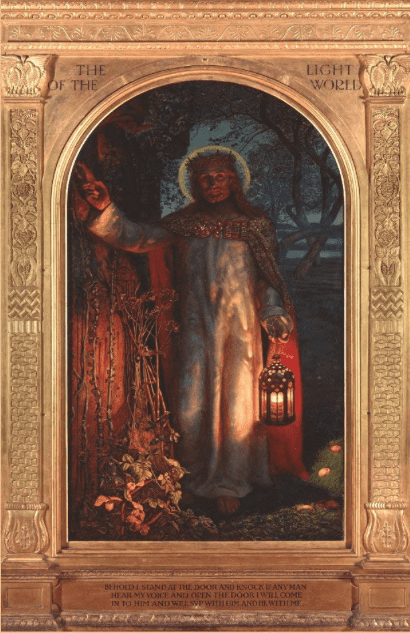 There is a famous picture by William Holman Hunt, it’s called ‘The Light of the World’. Most Christians of a certain era will remember it I’m sure. My parents had a copy on the wall in our hallway when I was a small child. It depicts the scripture “Behold I stand at the door and knock.” (Revelation 3:20). In the picture the door handle is missing. There is no visible lock or keyhole on the outside. The door is semi covered by overgrown vegetation, and it is shut fast. The dark background sky suggests that it’s evening time. Jesus, the Light of the World, stands in the act of knocking, waiting for the door to be opened, and to be invited in to share food, drink and conversation with the people on the other side of the door. It would seem He’s picked a time when most people will be at home, and ready to settle in for the evening. As I thought about this picture, I found myself questioning, is Jesus invited into our churches as an occasional, casual acquaintance, or is He free to come in any time, given the full run of the house with the best place at the table, and a cosy seat by the fire? Jesus said that He wants to be invited in and dine with us. That says a whole lot to me. He wants to come to MY church which definitely isn’t a palace, sit at MY church’s table which has seen better days, and dine with MY church using our every day common utensils. This is all at MY church’s invitation. Now this is the King of Kings we’re talking about! Sometimes even in our churches and families people can feel they don’t belong, or they aren’t good enough, uninvited, but Jesus is willing to take time and come down to our level, to enter our church spaces and places, which may be very un-mansion-like; to come eat and drink with us, give us that real sense of belonging, and have real heart-to-heart conversations. He is waiting for that door to be opened up and to be invited in. In the picture you can clearly see that Jesus carries His own light. He is the Light we need to illuminate the darkness in our churches where the light and fire of God have all but gone out. We can depend on His light to brighten our way regardless of the circumstance. I can imagine the people on the other side of the door in the picture with a faint flickering candle, or a light bulb that’s about to die, flickering on and off. 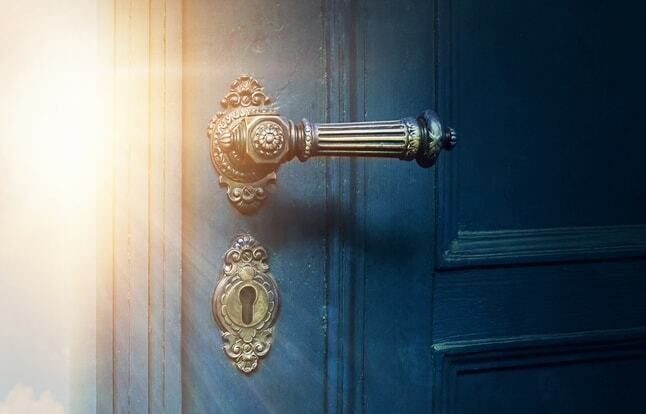 However, when they open the door to Jesus, the light He brings into the room is clear and brilliant, illuminating every corner, with no need for any other light sources. Not only does that light illuminate the house, but that light can be seen by neighbours and passers by in the street. One thing I love about this picture is it shows that Jesus the Light of the World, although shining so brilliantly, will not force His way into where He is not welcomed or invited. He patiently desires that we choose to open the door, let Him in and invite Him to eat with us. Some of us as churches are so busy doing good, seeker-friendly, and politically-correct things, that we have literally left Jesus standing outside a locked door, while we try to keep up with the world using the world’s ways. In times when we should be shut in with Him seeking to hear what is on His heart, we can get so busy doing our own thing and effectively, shut Jesus out. The Church will never accomplish it’s purpose on the earth if we don’t start to give time and space to hearing what God is saying to us as the Church about who He is, and who we are called to be corporately. Isaiah 55:6 says we should seek the Lord while He may be found, and Isaiah 55:8-9 tells us that God’s thoughts are not our thoughts and His ways are not our ways; God’s thoughts and ways are higher than ours. We cannot presume to know what God thinks about anything, or how He wants us to serve our community without spending time hearing from God in our times of gathering together, as well as in our individual prayer closet. Later in this same chapter 55 of Isaiah and verse 11, it tells us that God’s Word that goes out of His mouth will not return back to Him void or useless, or without accomplishing what it was sent to do. So, being open to the word that has already been prepared for us to hear and activate is a vital part of opening the doors of our churches to Jesus and inviting Him in. I personally believe Jesus is calling to His church with an urgency that we ignore at our peril. Regardless of how late the hour is, it’s never too late to open the church door to Jesus and invite Him in and hear what’s on His heart.